The powerful flavonoid chrysin (5.7 Dihydroxyflavone, found naturally in the plant Passiflora caerulea) is uniquely able to inhibit the process of aromatisation that converts testosterone into oestrogens in men as they grow older and which is largely responsible for their relative feminisation, particularly gynecomastia. A number of studies have shown that testosterone levels increase when the action of the enzyme aromatase is blocked. 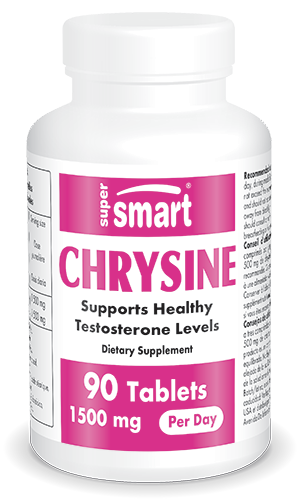 Chrysine is therefore used in conjunction with testosterone precursors or stimulators (tribulus terrestris, tongkat ali, Dehydroepiandrosterone) to prevent the age-associated and perverse process of converting testosterone into oestrogens. Athletes and body-builders typically take two to three grams of chrysin a day. Those who simply wish to increase their testosterone and reduce oestrogens generally take one to two grams a day, adapting the dose in response to the results achieved. Chrysin bioavailability is relatively low but can be significantly improved if accompanied by a Bioperine® supplement - a black pepper extract standardized in piperine - (see code 0111 for this phytonutrient) which improves its absorption at little extra cost. Each vegetarian capsule contains 500 mg pharmaceutical grade chrysin. For adult males only. Take two capsules in the morning and/or two in the evening, together with 10 mg Bioperine® per dose if desired, or as advised by your therapist.